Sunday night, I had the opportunity to attend a Chocolate Party! And yes, it was as awesome as it sounds. What made it extra-special was that it was hosted by a chocolatier in training. 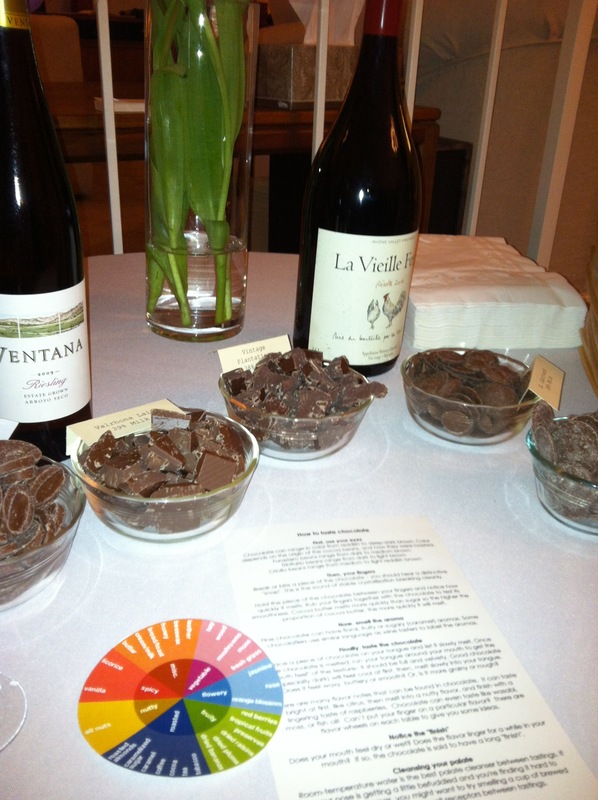 She put out bowls of samples from all over the world, had wine pairings, and gave instructions on the proper way to taste chocolate. I, like most people, have always loved chocolate. I can honestly consider that a part of my identity I have always known about and embraced (sometimes a little too much!). But how much do we really KNOW about some of the things we love? For decades, I’ve been enjoying chocolate, and I never stopped to think about the process of making it, or what differentiates levels of cocoa, or anything but the easiest way to get it into my belly! The tasting party was an eye-opening experience. To learn what the color, sound of the “snap,” and smell say about the chocolate’s properties was really interesting! And being cognizant of the many facets of the chocolate piece made the experience of eating it much more rewarding! So, I took some valuable information away from this experience, both about chocolate and myself. I learned that exploring how something came to be and what makes it special can thoroughly enhance your enjoyment of it. This entry was posted in New Activities, New Discoveries and tagged appreciate, art, chocolate, chocolate tasting, happiness, imagine, psychology, research, self-discovery. Bookmark the permalink.